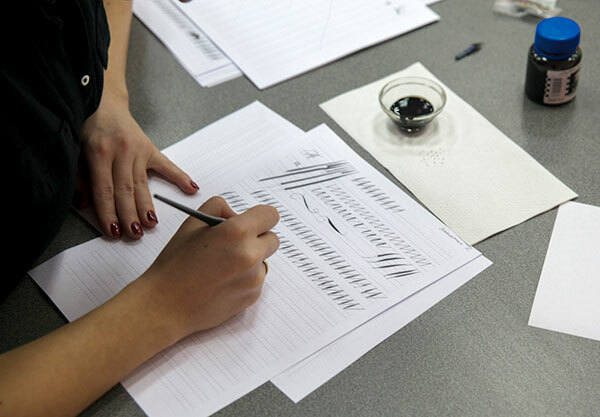 On 27th and 28th of March from 7 p.m. to 9:30 p.m. a 2 day term “Pointed Pen” intensive course related to the pointed pen writing technique will be held. Under the guide the teacher Artem Lebedev, calligrapher and designer, the participants will get acquainted with the tool’s specific skills and the main style of writing it can perform – English italics, as well as with the calligraphic techniques of decoration of the writings. After training of the basic exercises, the participants are offered the opportunity to create a comprehensive script composition. You will be excited by the process of creation, the fascinating story about the technique of working with pointed pen, the lively communication with experienced master. Are you missing experience? In that case this intensive course is especially dedicated to you! A full exposure to pointed pen calligraphy, pleasant atmosphere in the Museum learning space. You are welcome, get involved and create your own exclusive works!